Taking a look at how the lifecycle of the scholarly book, and how the concurrent move toward a database structure for dissemination of scholarship in article and monographic form, has the potential to further promote an emerging new ecology of serial discourse. In the Albanian novelist Ismael Kadare's 1980 novel The Palace of Dreams, spies lurk in the corners of taverns, coffee shops, town plazas, parties, and other gathering places in order to overhear people talk of the dreams they had the night before, and then report them to a central agency where they are analyzed and correlated with other overheard dreams for the indications they may provide about events and attitudes that will emerge from the subconscious to action and tangible reality. Kadare's vision of a surveillance bureau for the unformed, still emerging impulses and desires revealed in a network of dreams is a fair approximation of the university press acquisitions editor's practice as scholarly communication — as distinct from scholarly publishing — continues to move online via informal modes such as blogs, microblogs, social networks, digital commons, and serial scholarship. We are increasingly in a position of tracking scholarly ideas as they emerge and take shape; correlating them with other emerging concepts; seeing them shared or challenged; and monitoring them as they coalesce into tangible form. Somewhat akin to William Gibson's famous definition of cyberspace as a "collective hallucination," the emerging scholarly spaces on the web including individual and collective blogs and scholars' use of commercial spaces such as Twitter and Facebook, and other online traces such as syllabi, CVs, conference programs, and open-access journal articles, become for the university press editor a kind of collective scholarly becoming. There is a massive flaw in this schema in that clusters of scholars and areas of scholarly inquiry have an unequal distribution and concentration on the web—architectural historians, by and large, do not dream in public the way that medievalists or 19th-century American literary scholars seem to. But, increasingly in certain areas in which we publish, we see scholarly projects emerge serially from the larval stages of Twitter or Facebook discussions through the chrysalis of blog posts and conference papers and unlike other, earlier, forms of editorial sleuthing, we can simultaneously obtain a sense of reception and audience, the extent of an author's network, and even the author's aspirations, from online scholarly communications. The editors with whom I work are constantly sending each other links to traces of projects, many at very early stages, that we discover online; in a recent University of Minnesota Press catalog, the first three titles all had social media connections as part of the acquisitions process. That same year our bestselling scholarly title had been published nearly in its entirety as serial blog posts. We also discover books that are unaccountably out of print and indications of authors who need to be translated online. To use another William Gibson concept, the scholarly acquisition editor's work is increasingly that of "pattern recognition" and not the mere bureaucracy of peer review that some imagine. 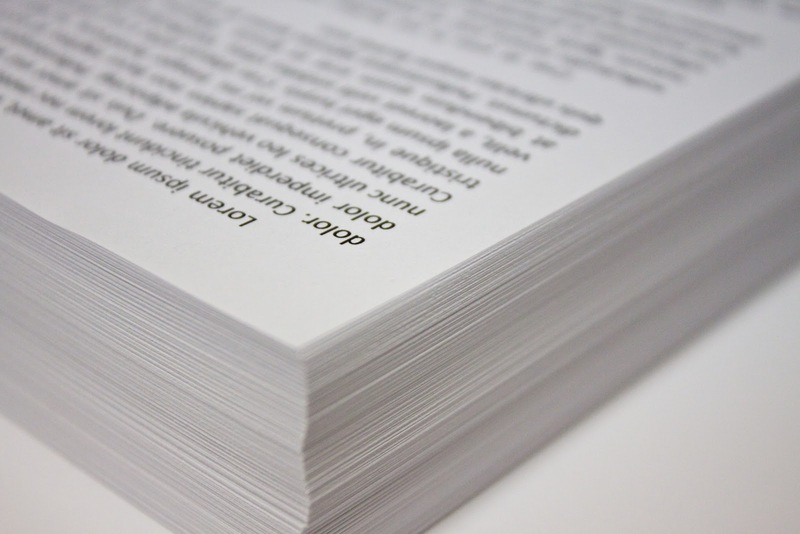 A columnist for the Chronicle of Higher Education came by the Minnesota (MLA 2013) booth and asked the question: "What percentage of prior publication makes you hesitate to publish a manuscript?" A bit too glibly, I replied: "100%". Too glibly, both because we would consider, have considered, and indeed regularly publish, single-authored books that are revised from100% previously available material and also because, for a project of limited or very focused potential, the prior publication as chapters in journal form or as an online dissertation may accomplish the level of circulation we believe that particular work requires. Similarly, our question considering works that have appeared serially online isn't, and this may sound strange, so much "have people already read it?" but rather "how many more readers can we find?” and “can we make more of it editorially?” Because, in our current cultural moment at least, people respond and act upon published books, in print or electronic form, differently than they do the serial form of the same material. An author I work with who has a widely trafficked blog, and who also contributes to even more trafficked sites such as The Atlantic's blog network (and, I should say, his books sell) has told me that people don't remember blogs, but they do remember books. This might not be true in a blog-intensive area such as Digital Humanities (though, in fact, I suspect it is) but it does hold for most scholarly publication where the authors of the most influential blogs are also the authors of some of the most successful books. For me, the current place of the individual book in this emerging ecosystem is as an area of highly concentrated, unitary scholarship amid a flow of less concentrated expression, with a membrane (let's dub that membrane "peer review," though it is more than that) regulating the passage between those environments as a form of osmosis. That flow of blog posts, social media interactions, conference papers, online discussions coalesces into the highly concentrated monograph or scholarly book (endosmosis) and then flows out again (exosmosis) in the form of other scholars' blog posts, social media comments, conference discussion, reviews and articles. The problem here, currently, is that that membrane separating the highly concentrated scholarly book from the overall flow of scholarly communication isn't as permeable as it should be—the membrane we've dubbed "peer review" also has pernicious, regressive layers known as "intellectual property" and "strained library budgets." 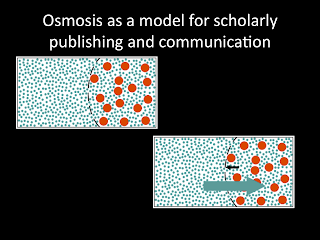 So what we need to do to make this environment function is to increase the passage between those serial molecules of informal scholarly communication and the more concentrated cells of scholarly communication. This requires a form of greater openness but not, I should say, one founded merely on blunt political and economic arguments with their appeals to either utopianism or neoliberal Creative Destruction, but rather on the common need to create a better, more interoperable system of scholarly communication and publication and a steady flow from the serial development of scholarship into the material event of scholarly publication and out again. Emerging collective publishing projects such as Books@JSTOR and the University Press Content Consortium at Project Muse provide the opportunity to reshape scholarly publication into database form and, in the process, both open that flow and equitably distribute costs across institutions worldwide. Let us now consider the possibility of a defeat. What will happen to a civilization that does not manage to overcome its information crisis? It will become transformed from one that studies “everything” (as ours does at the moment) into one that only focuses on a few selected directions. With each one of those directions gradually beginning to experience the lack of resources, their number will steadily decrease. As attractive as the concept of free and ungirdled information and scholarship may be, it will, as Lem projects, lose its vitality if it is not managed, regulated, constrained. We need, I believe, to encourage and celebrate the practices of serial and often informal scholarly communication but also preserve the cultural strength and presence of scholarly publication, increasing the flow between and interoperability of the two in order to protect our discipline from the form of extinction that Lem foresees in the apocalyptic battle of the disciplines that will come as we approach "peak information." This discussion was presented by University of Minnesota Press director Doug Armato at the 2013 MLA convention's Serial Scholarship Roundtable. The panel was moderated by Mark Sample (George Mason University) and included participants Kathleen Fitzpatrick, Pomona College/MLA; Frank Kelleter, University of Gottingen (Germany); Kirstyn Leuner, University of Colorado at Boulder; Jason Mittell, Middlebury College; and Ted Underwood, University of Illinois, Urbana-Champaign.